Tag League is a non-tackling game based on Rugby League. Normal dimensions of the field are 70 metres x 50 metres. Two fields will fit on one rugby or soccer field. Eight players in each team are on the field at any one time. Players wear shorts with a Velcro patch on each side. A strip of cloth is attached to the Velcro, known as a tag. The object of the game is to score tries. 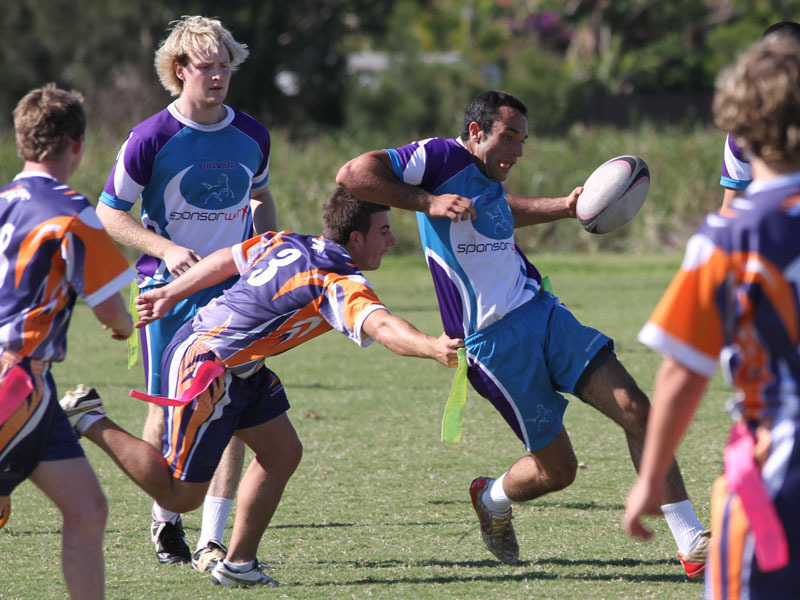 Defenders prevent this by tagging the ball carrier, removing the tag from the shorts. In Tag League, the attacking team has six plays or tags to try and score a try or promote the ball down field as close to the line as possible. The game is exciting due to the positioning of the tags, which can be difficult to remove. The use of tags also prevents phantom calls. Your either tagged or your not. 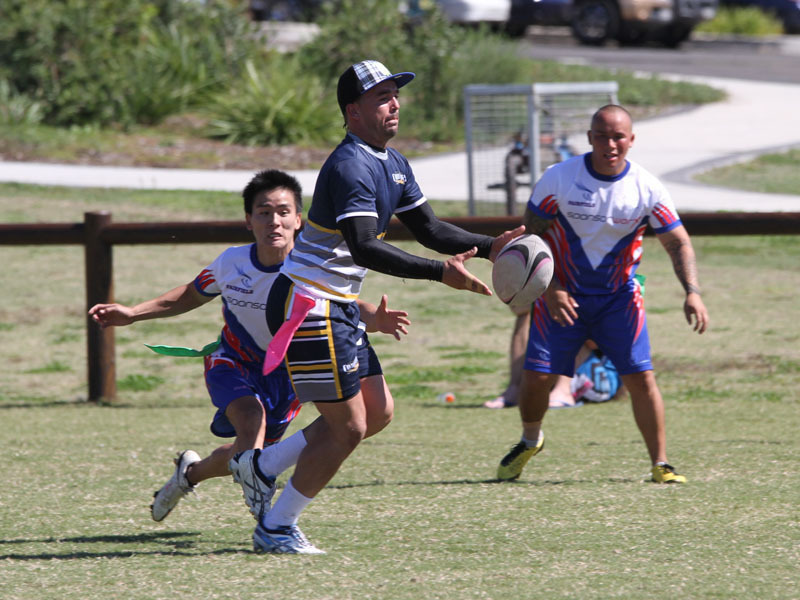 All Rugby League skills are utilised in Tag League, including kicking. Passing becomes an attacking weapon, and if a player is put into a gap, there is a high probability they will make a clean break. When attacking the line, fancy moves such as around-the-corner passes work well, often making the defender stoop low to remove the tag. The game is a low/medium-contact sport and the rules are designed to encourage this. You cannot as an attacker run straight at a defender, you must run at the gaps. A defender cannot impede the progress of an attacker, so if you try to get a tag and bump the attacker you may well be penalised. The rule is whoever initiates contact will be penalised. The rules allow for the ball to go to ground with the advantage rule applying - this results in a lot of broken field play. Teams kick off to commence play and restart play after a try has been scored. Line drop-outs are taken from the centre of the try line. Kicking in general play is allowed but it must be below shoulder height of the referee, with chip kicks permitted only if the kicker regathers. Games are usually played over 40 minutes, two twenty minute halves. Times may be varied to suit age groups and conditions. Games are organised by Division, with Mens, Womens and Mixed competitions usually offered all year round. Depending on the competition size, Divisions may be graded. Junior competitions are also offered seasonally, with modified rules applying to suit different age groups.